Edith Irene Södergran was a Swedish-speaking Finnish poet. Södergran was born in St Petersburg in 1892. In 1907, Edith's father died from tuberculosis and in the following year, Edith was also diagnosed with the disease. She was sent to a sanatorium, but did not feel at ease there. The feelings of captivity caused by the disease and the sanatorium are a recurring theme in her poetry. 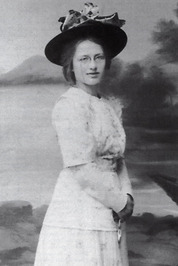 In October 1911, Edith and her mother traveled to Arosa in Switzerland where Edith was examined by different doctors. After a few months, she was transferred to the Davos-Dorf sanatorium. In May 1912, her condition had improved enough for her to return home. Eventually, the disease returned and Edith Södergran died in 1923 in her home in Raivola. She was 31 years Edith Irene Södergran was a Swedish-speaking Finnish poet. and naked I came to you, resembling a woman. and drank a toast with wine and breathed in the scent of several roses. I knew only that your caresses held me captive. And, smiling, you took up a mirror and bade me look. I saw that my beauty was sick and had no desire other than to - disappear.